Today I’m excited to interview Jonathan Auxier. His debut book PETER NIMBLE AND HIS FANTASTIC EYES was released on August 1, 2011. And today's his birthday! Now, f or those of you who know anything about blind children, you are aware that they make the very best thieves. As you can well imagine, blind children have incredible senses of smell, and they can tell what lies behind a locked door- be it fine cloth, gold, or peanut brittle- at fifty paces. Moreover, their fingers are so small and nimble that they can slip right through keyholes, and their ears so keen that they can hear the faint clicks and clacks of every moving part inside even the most complicated lock. Of course, the age of great thievery has long since passed;today there are few child-thieves left, blind or otherwise. At one time, however, the world was simply thick with them. This is the story of the greatest thief who ever lived. His name, as you've probably guessed, is Peter Nimble. Hi Jonathan. Thanks so much for joining us. And Happy Birthday! Thanks so much! I’m not actually a big fan of birthdays (at least not my own), but getting to be on Literary Rambles makes for a pretty cool present! 1. So glad it makes your birthday a little more special. Tell us a little about yourself and your book. 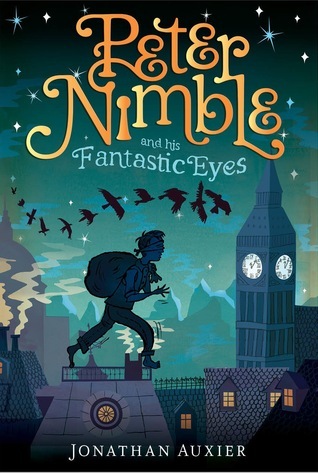 Peter Nimble & His Fantastic Eyes tells the story of a ten year-old blind orphan who also happens to be the greatest thief who ever lived. It’s a story that came out of a lifetime of reading and collecting classic children’s books -- from Alice Through the Looking-Glass to Treasure Island to Wizard of Oz … Peter Nimble is a sort of love letter to all the books that shaped me as a writer and human being. 2. I love how you used the three pairs of magical eyes as the basis of the magic in your story. How did you get the idea to use that in your story? One of my favorite authors is Ronald Dahl. A while back I started seeing a pattern of wish fulfillment in his stories. From Matilda to The BFG, he creates stories in which a suffering character receives something magical that speaks directly to their need in a funny, wondrous way. Take Charlie and the Chocolate Factory: it’s the story of a boy who is starving -- literally suffering from starvation. And what does Dahl give him? He gives him a factory made of candy. Not just food, but candy -- the most decadent food any boy can imagine! Of course, along the way, Dahl also begins to address a deeper longing within his characters, which is where the real story resides. So to answer your question, I began Peter Nimble with a character in need: a weak, blind orphan thief. Then I asked myself what would be the one thing such a boy would wish for? Well, eyes make a lot of sense, at least on a surface level. But in the spirit of “be careful what you wish for” (something else Dahl is a master of), I decided that the eyes needed to be a little bit of a mixed blessing -- they do impossible things, but not always what Peter wants them to. Really, the eyes are less an antidote to Peter's blindness than a promise of something better than a life of crime -- which is his deeper longing. 3. That is so awesome how you learned from one of your favorite authors and applied it to your own writing. I read that you have a background in screenwriting. A lot of writers read and recommend books on how to write a screenplay in helping to develop solid plots. How did your experiences in writing screenplays help you in developing your plot? I can tend to be a bit abstract and rambling in my thinking, but theatre and film writers can’t afford to ramble: they have two hours to tell a story, and if the pace lags, people will start walking out. This starts and ends with a well-structured plot, which is pretty much the only tool dramatic writers have to work with -- if it’s not something a character does or says, it doesn’t make it into the story! How does this apply to fiction? With fiction, there are almost no restraints to what a writer can do or say. This is part of what makes great books great … but it is also what makes bad books bad. It’s the old “enough rope to hang yourself” thing. Starting with structure gives me the necessary leash to make sure I don’t go too far astray with my story. The metaphor I’ve always used for this is a madman in a padded cell: the madman can flail and scream and jump around all he wants without hurting himself because he has this cell around him that will protect him. Story structure is my padded cell! 4. That's a great way to describe the perils of too little structure. How are you marketing your book and what advice do you have on marketing for other middle grade authors? Another example is this great publishing blog run by two authors called Literary Rambles … ever heard of it? In that spirit, I’ve spent the last year running www.TheScop.com, a website dedicated to exploring the connections between children’s books old and new. It’s a chance for me to roll up my sleeves and see how trends in contemporary literature connect with the older tradition (which is my real passion). It’s probably not the most efficient way to get my name out there, but it is certainly a lot of fun! 5. Glad you like our blog. And I agree that it's best to use your blog as a service to others and not just to promote yourself. Do you have any other advice for debut authors? As I am just barely a debut author, I hardly feel like an authority. I would say that it’s very hard having something you love go into the world for people to discuss. It’s a special kind of vulnerability, and any review short of “best book ever!!! !” feels like a crushing blow. One thing I have made a practice of doing is never reading reviews. Not even Goodreads or Amazon comments. My wife gets Google alerts on all that stuff, and she keeps me abreast of what people are saying. That seems to keep the crazy at bay … for now, at least. Rest assured, I will find something else to obsess over soon enough! Thanks for all your advice Jonathan. Good luck with your book. You can reach Jonathan at his blog. Jonathan and his publisher have donated a copy of PETER NIMBLE AND HIS FANTASTIC EYES for a book giveaway. All you need to do is be a follower (just click the follow button if you're not a follower) and leave a comment by midnight on August 20th. I'll announce the winner on August 22nd. International entries are welcome. ... Mad-Eye Moody, is that you? Would love to read this book. Sounds like a great adventure! Jonathan is awesome! I love that his passion for books and writing just jumps right off the page at you! Thanks!! Thanks for letting me be a part of your blog! My favorite thing about this post is how Casey and I have headshots across from each other. We're both staring directly at the reader with our best "not quite smiling" face. Looking between the pics makes me feel like I'm in a room or people who are about to start laughing at me! I am very excited about this book. And to think it was inspired by Roald Dahl, one of my favorite writers! This sounds like such a delightful read. I'd love to win a copy! Jonathan, it does look as though we're looking out at an audience! I'm quite sure those are faces of delight we're seeing, though! I have to echo Jill. I just love how strongly your passion for children's literature, classic and current, comes through. I'm really looking forward to reading this! I think it will appeal to my rather particular middle grade tastes. Jonathan's book sounds like a great read. Thanks for the interview and the opportunity to win a book! Oh, and one more thing, Jonathan. Sounds like a great book! I'd love to read it! So excited for PETER NIMBLE! Went to download on my Nook, but, unfortunately, they don't have it. Crossing my fingers to win! Happy Birthday Jonathan! I won an ARC of Peter Nimble from Shannon Whitney Messenger at http://ramblingsofawannabescribe.blogspot.com/2011/08/winners-and-whew.html. Looking forward to reading it and sharing with my 9 year old daughter/Ronald Dahl fan. Wow! Great premise! It sounds like a classic book in the making already! Congrats to Jonathan (and happy birthday!). Congrats on your debut novel :-) I really like the cover. It's very eye-catching. The story also sounds very appealling. Best of luck with your book and please enjoy your birthday. Thank you for the interview, Jonathan and Natalie! I would love to win a copy of this! The part about this being a love letter - I really get that. The book I'm working on is a testimony to the books I love, have loved reading to my kids, and have shaped me AND my kids. Thanks for the great interview Jonathan. Glad everyone enjoyed the interview. I so want to read this that I wish I could enter the contest. I love the comparison to the classics. Good luck Jonathan. I saw this book on Goodreads and thought it looked fabulous. Now I have to check out www.TheScop.com. Thanks for sharing! Great interview. What an interesting book! Thanks for a great interview! The book sounds fabulous. That was a fabulous interview! Thank you! And please do enter me to win the book. My 10 year old and I will both love it, I'm sure! I love how he took a new concept and viewed it through the lens of a gifted writer. Dahl's books are timeless, and this book sounds like it fits right in with that type of book. I really like the idea behind it. What an incredible interview. I LOVED this book. Nice to know Jonathan was influenced by Roald Dahl. That was one author I didn't think of when reading this book, but now it makes total sense. This book sounds excellent. I love Dahl's books. Win or not, this is one book I'm going to read. Thanks for the interview, Natalie. And happy belated birthday to Jonathan. hi miss natalie and mr jonathon! happy birthday!!! guess what??? i won that cool peter nimble book on miss carolinas blog and it on the way to my house. :) i cant wait to read it. im thinking its gonna be pretty exciting. i like the cover lots. I would love to win a copy. I love the cover design. Very interesting! Thanks for the interview. Loved hearing the ins and outs of your process. Now if I can just gut the innards of Charlotte's Web and the brilliance of E.B. I'll feel a lot better. Peter Nimble is an astounding piece of art. Yes, It's a story of a 10 year old boy, but it's not only a children's book, it's more than that! I'm a mother of a 15 month old son and I read it myself and to my baby! Great literature doesn't have age restrictions! Awesome job, Jonathan! PS I would love to win a free copy and keep sharing it with my friends and their children! I heard about Peter Nimble from Shannon Messenger, and I'm really looking forward to getting my hands on a copy (maybe via this comp, who knows!). I absolutely love Jonathan's dissection of how Roald Dahl's books work. I've just finished re-reading Danny The Champion of the World, and I see completely what he means! Best of luck with the debut -- sounds like a fantastic story! After reading SO many positive reviews from SO many excited reviewers regarding this book, I am just dying to read it and share it with others. This book looks fantastic!! I hope I win so I can read it right away. Thanks for bringing it to my attention. This looks like a great read. And this was a GREAT interview. Thanks for the tips, metaphors, recommended blog sites, and great interview. Best of luck to you on all future journeys. Thank you so much Jonathan and Natalie! Everyone is talking about this book right now. EVERYONE. But NOT everyone has an awesome interview to go with their positive reviews! I love what you said about wish fulfillment, and how you wanted to turn it on its head a bit. That's such a great way to begin the germ of a story. Thanks for the fun interview, and thanks for the giveaway! Oooh! Enter me to win. This book sounds amazing. Not many book descriptions grab me right away, but yours does! Whether I win this giveaway or not (thank you, by the way), I am definitely going to read your book! We'll probably read it out loud as a family. Unique subject matter that will appeal to all! Great interview! Thank you for the giveaway! I've been looking forward to Peter Nimble since the moment I came across Jonathan Auxier's website, The Scop. The site is simple, the sketches are fun and that might be the best "about me' section I've ever come across. So to hear Jonathan was publishing his first middle-grade this fall, literally made me giddy.